This entry was posted in Media, Providers and tagged Media. Bookmark the permalink. 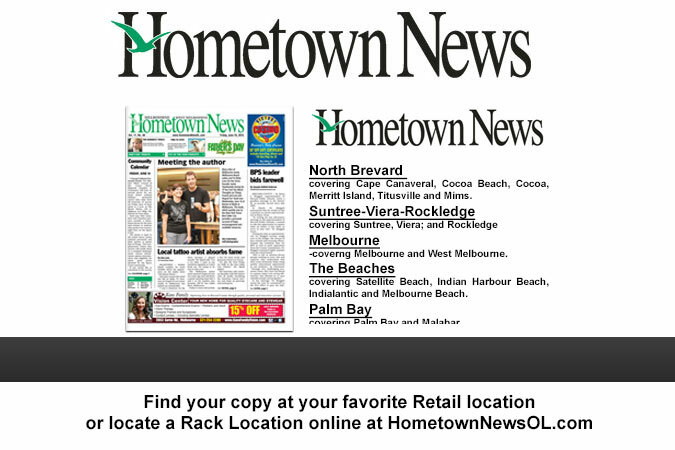 Hometown News features five different editions in Brevard County: North Brevard (which covers the municipalities of Cape Canaveral, Cocoa Beach, Cocoa, Merritt Island, Titusville and Mims); Suntree-Viera-Rockledge; Melbourne (which covers the cities of Melbourne and West Melbourne); The Beaches (which covers the municipalities of Satellite Beach, Indian Harbour Beach, Indialantic and Melbourne Beach); as well as Palm Bay (which covers Palm Bay and Malabar). Each edition provides a blend of news stories, feature articles, profiles and coverage of importance to the residents and visitors of each particular area. The Hometown News publication is also home to a weekly arrest report, a community notes section, a business news section, Rants & Raves, a variety of personal columns, covering a multitude of subjects, as well as a weekly community calendar that provides readers with the county’s most appealing upcoming events. A quality Helping Seniors Provider Network participant. Click the Donate button to donate securely online today. ©2019 Helping Seniors of Brevard. Powered by TYG Media.